A Schematic overview Map of the Entire Length of the Karakoram Highway (KKH), known as the highest paved road in the World. Map Area depicted: Karakoram Highway in the Region between Kashgar in China and Islamabad and Peshawar in Pakistan. 2000 AD: Cathedral and Churches of Echmiatsin, the mother Church of the Armenian Apostolic (Christian) Church and considered the oldest Christian Cathedral in the world, as well as the Archaeological Site of Zvartnots, a ruined 7th century AD Cathedral, two historical sites in Amavir Province of Armenia (State) are made UNESCO World Cultural Heritage sites. March 2, 2001 AD : The Taliban Muslim Fundamentalist Regime of Afghanistan robs its People of their Cultural Heritage by destroying the Silk Road Buddhist statues of Bamiyan. On the face of a mountain near the city, three colossal statues were carved 4,000 feet apart. One of them was 175 feet (53 m) high, and on record as the world's tallest standing statue of the Buddha. The ancient statue was carved during the Kushan period in the fifth century AD. In the aftermath of this savage act of vandalism the world's earliest oil paintings were discovered in caves behind the partially destroyed colossal Buddha statues. The oil based paintings, possibly using either walnut or poppy seed oil, are present in 12 of the 50 caves dating from the 5th to 9th century. displaying archeological finds and the lessons learned from them. In addition, the city of Acre (Tell El-Fukhar ; Hebrew: Tell Akko) in northern Palestine (Occupied by Israel), ranked as one of the oldest cities in the world with the earliest finds dated to around 4000 B.C. is also inscribed as World Cultural Heritage. 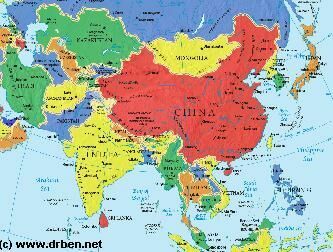 Saturday, June 17, 2017: With 18 airports and airfields operational in the Xinjiang-Uighur Autonomous Region of China (P.R.C. ), which is home to long stretch of the so called "silk road in China", the Chinese Government announced the planned construction o‍‍f 10 more airports across the region by the year 2020 (in 3 years). With the suggested message that all airfields are to serve civilian purposes, the announcement included details for the construction of an additional airport in the restive Hotan City Prefecture, to be situated at the famous historic Silk Road Town of Keriya (Chinese: Yutian) in the far east of Hotan Prefecture. According to the announcement, the new Yutian Airport will have a single 3200 meter long runway. Wednesday, 21 June, 2017: In the oil city of Mosul in northern Iraq , ISIS destroys the Grand Al Nuri Mosque (Arabic: جامع النوري‎ Jāmiʿ an-Nūrī) and its 45 meter (150 ft) tall Al Hadba Minaret, both counted as historic cultural and architectural treasures along the Silk Road in Mesopotamia. Reportedly, the mosque was blown up with explosions when Iraqi National Army units were within 50 meters of re-taking the historic religious building. The medieval time mosque was named after Nuruddin Al-Zanki, a local Noble who fought the earliest European crusader armies from his fiefdom which encompassed much of current day "Kurdistan", with territory in Syria, Turkey and North Iraq. The mosque was constructed shortly before the death of Nurrudin in 1172 or 73 AD and originally housed an Islamic School (Madrasa). In Iraq the act of destruction was immediately condemned as a crime against all Iraqi people, and furthermore a factual admittance of defeat of ISIS. July 2017: The ancient silk road City of Yazd (Persian: یزد)(also Yezd), Capital of Yazd Province in central Iran, famous for its architectural feautures, religious heritage and for being a thriving Silk Road market town through centuries, is made a UNESCO World Cultural Heritage site. Along with the city of Yazd various other sites in Asia receive the official UNESCO recognition and funding, including the Old City of Hebron on the west bank of the Jordan River (a part of Jordan occupied and absorbed by Israel). June 21, 2014: The Citadel of Erbil, locally identified as the Qalat (Kurdish: قەڵای ھەولێر Qelay Hewlêr ; Arabic: قلعة أربيل), an ancient Tell and defended natural stone mound of which the earliest known remains date back as far as the 5th century B.C., situated in the city of Erbil, considered the Capital of the Kurdistan Region of northern Iraq , is inscribed as a UNESCO World Cultural Heritage Site. Although the citadel has seen large restorations since 2007, when nearly all inhabitants of the protected area were moved out, in order to ensure the continuation of 8000 years of human inhabitation of the site and prevent the citadel from becoming a lifeless museum, it is planned that some 50 families will be allowed to live inside it. In the same 38th session of the United Nations world heritage committee, the ancient Greek City of Pergamon (Bergama) and its ancient cultural landscape, today a part of Bergama in Izmir Province of Turkey is also listed as UNESCO World Cultural Heritage. Additionally, Shahr-i Sokhta (Shahr-e Sūkhté (Persian: شهرِ سوخته , meaning "[The] Burnt City") identified as an early bronze age settlement associated with the late 3rd millenium B.C. Jiroft Culture, situated on the banks of the Helmand River in Sistan and Balochistan Provinces of Iran, is also listed. July 2014: ISIL fighters try to demolish the 840 year old minaret of the Grand Al-Nuri Mosque in Mosul and fail. The minaret is protected by local residents who litterally form a human ring around the Mosque in order to protect their proud heritage. June/July 2015: Al-Maghtas (Arabic: المغطس), in the west known of the Baptism Site of " Bethany beyond the Jordan " , a historical site along the Jordan River in Jordan world renowned from biblical versus of the Gospel of John and associated events, is inscribed us a UNESCO World Cultural Heritage Site. YouTube video: 10 minute excerpt of Christian Frei showing his film to the people of Bamiyan in the year 2005. 2005: Swiss filmmaker Christian Frei made a 95-minute documentary titled The Giant Buddhas (released in March 2006) on the statues, the international reactions to their destruction, and an overview of the controversy. Testimony by local Afghans validates that Osama Bin Laden ordered the destruction and that, initially, Mullah Omar and the Afghans in Bamiyan opposed it. In the aftermath of the creation of the film Frei travels back to Bamian fulfilling his promise to come and show the results of his work to the people of Bamiyan. Mediterranean terminus of both the Incense Road and spice trade routes. As a group, these desert cities demonstrate the lucrative trade in frankincense and myrrh that took place from Yemen in south Arabia to the port of Gaza on the Mediterranean. 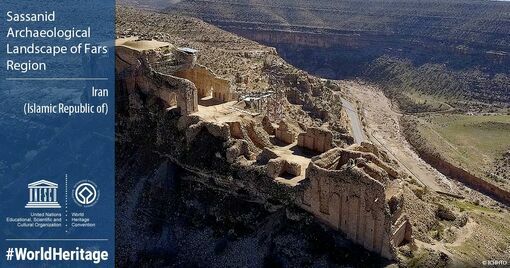 At its height, the route included cities, Qanat irrigation systems, fortresses, and caravan serai. Vestiges of these works are still visible, and demonstrate the use of the desert for commerce and agriculture. 2005 to 2007: in the period of two years, at least six times, dried and parched remains of modern humans are recovered from the depths of the Lop Nor Desert and investigated by authorities. In 2005, in commemoration of NHK's 80th anniversary, CCTV and NHK jointly produced for the second time a Silk Road documentary. The 10-part series, according to the general director, takes a new approach to the subject, as it reveals many of the archaeological discoveries and relics that have not been disclosed to the public in previous documentaries. The footage was edited into separate Chinese and Japanese versions. Known as "The New Silk Road", the Chinese language series was first aired in 10 March 2006 and, as with the earlier Silk Road I expedition footage taken in 1979, has been classic silk road film documentary material ever since. 2006: National Highway S235, leading from Hami (Kumul) to the dried up Lop Nor basin is completed. The road serves traffic between the small industrial town established at Lop Nor and the infra-structure node at Hami. 8 to 16 July 2006: At the 30th Session of the UN Heritage Committee, both the Krak des Chevaliers (Castle Alhsn ; Arabic: حصن الفرسان), in the 12th Century A.D. a Castle and Lair of the (Christian) Knights Templar, and a currently a site in a the disputed border between Lebanon and Syria, was given UNESCO World Cultural Heritage status. In the same session, the historically associated Citadel of Salah El-Din (--) also Salladin Castle or Sahyun, situated 25 kilometers (16 miles) due north-east of Latakia in north west Syria, is also inscribed on the UNESCO World Cultural Heritage list. 2006: The Behistun Insriptions (also Bisotun, Bistun or Bisutun; Persian: بیستون , Old Persian: Bagastana, meaning "the place of god"), a multilingual inscription authored by King Darius I "The Great" of Persia (Life: 550 B.C. - 486 B.C.) at some time during his life and known to the world since the year 1598 AD, are given the status of UNESCO World Cultural Heritage Site. Although listed as located in Iran at Mount Bishutun, the site, covering 1116 hectares, is factually situated in the border region (bufferzone) between Iran and Iraq. On 26 January 2007, Mawlawi Mohammed Islam Mohammadi, the by then former Taliban Governor of Bamiyan together with Taliban spiritual leader Mullah Omar seen as the main culprit behind the destruction of the Bamiyan Buddha's was assassinated in Kabul. In 2007 large scale renovations and preservation works start in Erbil‍ ‍‍(also Arbil or Irbil)(Kurdish: ھەولێر‎ Hewlêr; Arabic: أربيل‎, Arbīl; Syriac: ܐܲܪܒܝܠ‎, Arbela), the Capital of the Kurdistan Region of Northern Iraq. In order to restore the historic Erbil Qarbat or Citadel City, all but one of the many families residing in this old quarter of the city are moved out. One family remains as custodians and in order to ensure the continuance of 8000 years of human inhabitantion of this site along the western silk road. June-July 2007: At the 31st Session of the United Nations Heritage Commission, the Gobustan National Park enclosing the Gobustan Rock Art Cultural Landscape found in Garadagh and Absheron Districts of Azerbaijan , not far from the National Capital City of Baku , are added to the listing of UNESCO World Cultural Heritage sites. The ancient Petroglyphs and rock carvings at Gobustan are situated on the extreme southern end of a rocky outcropping of the Caucasus mountains very near the west coast of the Caspian Sea. Together with cave dwellings, settlements and burial sites, they encompass some 6000 stone inscriptions dating between 40 thousand years B.C. and around 5000 B.C. thus representing a long period in the pre-silk road era between the stone age and more modern era's thus giving modern humanity a unique insight to cultures, habits and knowledge now long disappeared and forever transformed. 2008: The Armenian Monastic Ensembles of Iran, wonders of Armenian architecture and decorative art, located in the West Azerbaijan and East Azerbaijan provinces in Iran, an ensemble of three Armenian churches that were established during the period between the 7th and 14th centuries A.D. are inscribed as a UNESCO World Cultural Heritage Site. 2008: Holy Places of the Bahá'í Faith (Persian: بهائی Bahā'i) in Haifa‍ ‍‍(Hebrew: חֵיפָה‬ Hefa [χei̯ˈfa, ˈχai̯fa]; Arabic: حيفا‎ ḥayfa) and the Western Galilee, situated in bufferzone 255 occupied by Israel, are inscribed as UNESCO World Cultural Heritage Site. November 12, 2001: Taliban forces abandon the Afghan Capital of Kabul in flight from advancing Northern Alliance troops backed up by US Special Forces‍.‍ The city of Kabul is taken by the Northern Alliance on November 14. In north western Afghanistan the ancient silk road city of Herat (Persian: هرات‎,Harât ,Herât; Pashto: هرات‎; Ancient Greek: Ἀλεξάνδρεια ἡ ἐν Ἀρίοις, Alexándreia hē en Aríois; Latin: Alexandria Ariorum) famous for its citadel of Alexander (The Great) was captured from the Taliban by forces loyal to the Northern Alliance and as well as Special Forces of the United States, the United Kingdom and the Islamic Republic of Iran. Subsequently, its former Governor and Muhadjideen leader Ismail Khan returned to power‍. In a swift campaign which lasts until December 12 of 2001, most of Afghanistan falls to the advance of American Troops under heavy support. In December of 2001, the historic Tora Bora (black dust) cave complexes - fortified natural caves which had served as rebel and guerilla hide outs since the area was known to westerners in the 19th Century (See previous page: Modern History of the Silk Road (8) 1800 AD to 1900) - situated to the south of the Khyber Pass in the Spīn Ghar mountain range, Pachir Aw Agam District (پچير او اګام ولسوالۍ), Nargarhar Province of Afghanistan become the target of a prolonged and heavy bombing campaign of the United States Airforce as groups of Taliban are found to be entrenched within the caves and tunnels of this area. Al Qaeda main terrorist leader Osama Bin Laden is rumored to be among them, drawing US special Forces and air power to this border region between Afghanistan and the FATA (Federally administered tribal areas) of neighboring Pakistan. 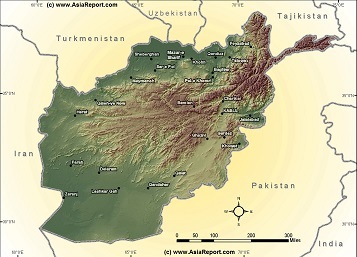 The Tora Bora campaign marks the ending of the US offensive in Afghanistan. While Osama Bin Laden escapes capture by US Forces, important parts of the caves are left utterly destroyed. 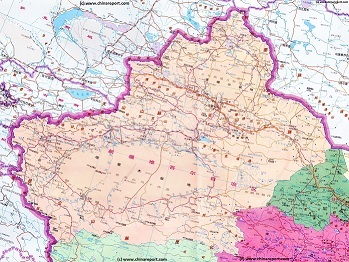 Schematic overview Map of the border regions between Afghanistan (left / west) and adjacent Pakistan, of which the FATA are continuously lawless. Regular Pakistani army campaigns try to keep these regions under Government control while local tribes attempt to keep their own rules and loyalties. 2003: Ruins of Aššur (Akkadian; Syriac: ܐܫܘܪ 'Āshūr; Persian: آشور : Āshūr; Hebrew: אַשּׁוּר Aššûr, Arabic: اشور : Āshūr ; Kurdish: Asûr), also known as Ashur and Qal'at Sherqat, in ancient history the Capital of the Old Assyrian Empire (2025–1750 BC), the Middle Assyrian Empire (1365–1050 BC), and for a time, the Neo-Assyrian Empire (911 BC – 608 BC), situated on the banks of the Tigris River in Saladin Governate of Iraq is inscribed as a UNESCO World Cultural Heritage site. December 26, 2003: (Bam earthquake) A massive earthquake strikes the Kerman Province in south-eastern Iran causing death and destruction. The earthquake, with a reported magnitude of 6.6 on the Richters scale, wipes out entire villages and towns and damages among things the ancient monument of the ruins of Bam. In the aftermath the death toll is estimated at between 20 and 47 thousand while a multitude is injured or rendered homeless. 2004: In the aftermath of a devastating earthquake which struck the regions in the previous december causing widespead damage among things to historic buildings, the ancient silk road city of Bam, also Arg-e Bam (Persian: ارگ بم ) in Kerman Province of Iran, once the largest adobe building in the world and the seat of the Achamaenid Empire in the 6th to 4th centuries BC, is inscribed as UNESCO World Cultural Heritage site. June 28- July 7, 2004: At the 28th session of the United Nations world heritage committee the city of Pars, ancient Pasagardae (Ancient Greek: Πασαργάδαι, Old Persian; Modern Persian: پاسارگاد Pāsārgād), city of the Silk Road and historic Capital of Cyrus the Great (Cyrus II of Persia (Old Persian: ���������� Kūruš; New Persian: کوروش Kūrosh; Hebrew: כֹּרֶשׁ Koresh; c. 600 – 530 BC), of the Achaemenid Empire (55 BC - 330 BC) situated in current day Iran, is inscribed as UNESCO Wold Cultural Heritage site. 2005: Biblical Tells (Natural stone mounds historically used for speaking sermons (etc)) of Beer Sheba, Megiddo and Hazor in Palestine (Bufferzone controlled by Israel) are given a UNESCO world Cultural Heritage Status. September 2005: Mawlawi Mohammed Islam Mohammadi, Taliban governor of Bamiyan Province (of Afghanistan ) at the time of the destruction of the famous Bamiyan Buddha's and widely seen as responsible for its occurrence, was elected to the Afghan Parliament. By the end of 2010 destruction was ongoing, with about 50% of the outlying parts of the historic old city of Kashgar cleared. According to local expat and observer Josh Summers of "Xinjiang; Far West China" (web site) the most visible and presentable old facades have been preserved especially in the main streets of the quarter and around the Id-Kah Mosque. Behind the facades however, the neighborhoods are hollowed out, the freed spaces to be filled with modern supposedly earthquake proof buildings. March 15 - July, 2011: A popular Civil Uprising against the Syrian Government led by Bashar Al-Assad (Son the deceased notoriously ruthless Dictator " President " Hafez Al- Assad of Syria (1971 - 2000)) spreads across Syrian Cities and territories. When the uprising is bloodily and very violently suppressed by Government troops, the in principle peaceful popular uprising soon transforms into an armed uprising, with multiple rebel groups with varying political ideas and social backgrounds vying to overthrow the central government while also often striving against each other. Although in essence a legitimate uprising through the peoples descent, the original conflict in Syria connects with ongoing instability in adjacent Iraq, thus evolving into an International War pitching Syria, supported by Iran, Hezbollah in Lebanon and by Russia, versus NATO, Anti-Assad Rebel Groups, the United States and various other regional Nations. A third party to arise from the chaos is a ruthless armed terrorist organization which names itself ISIS or ISIL (Islamic State of Iraq and the Levant ; الدولة الإسلامية في العراق والشام). It's leadership, although highly secretive declares the goal of establishing an (terrorist fundamentalist) Islamic State on the territories of Syria, Iraq, and a multitude of other Nations in the Middle-East, North Africa and even Central Asia and south-east Asia. July of 2011: start of a multi-party Civil War in Syria, is later joined by various outside parties. The Syrian Civil War ongoing, tremendous damage has been done to the Nation, Cities, infrastructure, heritage and people. A multitude of historic sites along the silk road in western Asia are intentionally or unintentionally destroyed in the war or by specific (religiously or politically motivated) actions aimed at their destruction. May 2, 2011: Osama Bin Laden, inspirational leader of the Al-Qaeda terrorist organization, main planner of the September 11 attacks in New York City and Washington D.C. and destroyer of the Bamiyan Buddha's is killed in his secret hide-out along the Karakoram Highway, which is the by-road of the Silk Road leading between Kashgar in Xinjiang and Islamabad , the Capital of Pakistan. An early morning raid by American Special Forces teams penetrates the Bin Laden compound near Abbottabad on the Karakoram Highway, killing Osama Bin Laden while securing valuable information. The body of the terrorist leader and several captives are removed with the team as black hawk helicopters return to aircraft carrier USS Carl Vinson (CVN-70) off the Pakistani Coast. Later that day the body of Osama Bin Laden is buried at sea after an Islamic ceremony. In June of 2011, the Kashgar to Hotan Railway became fully operational, connecting from Kashgar Main Train Station eastward to Hotan with a stop at each county town along its way. To date there is but one train daily from Hotan to Kashgar with a travel time of some 8 hours. June 2011: While the Nation of Syria descends into civil war and utter chaos, The Dead Cities (Arabic: المدن الميتة ) or Forgotten Cities (Arabic: المدن المنسية ), a group of 700 abandoned settlements in northwest Syria between Aleppo and Idlib with a history dating to the period between the 1st and 7th century A.D. are made a UNESCO World Cultural Heritage site during the 35th session of the United Nations World Heritage Committee. In 2011: Entirely unexpectedly, Washington University anthropologist Michael Fragetti rediscovers the lost silk road city of Tashbulak, once a stronghold of the Qarakhanids (999 AD - 1211 AD), who at one time controlled a large part of the Silk Road in Transoxiana, in what today is the mountainous border area between Namangan Region of Uzbekistan and neighboring Tajikstan. Situated in pasture land in a hidden valley at above 2000 meters (6500 ft), the small expedition found ceramic shards, undulating buried mounds and other signs of a larger urban settlement at an usual height. Pilot excavations in the next summer of 2012 revealed buried buildings. Since, intensive surveys and further excavations have revealed an ancient civilization lost in history for nearly 1200 years. By now a massive necropolis with over 300 bodies has been identified, along with a water reservoir, an enclosed (walled) citadel, and a space where iron working was done. 25 June- 5 July, 2012: At the 36th session of the United Nations world heritage committee, the Birthplace of Jesus: Church of the Nativity and the Pilgrimmage Route in the town of Bethlehem, Bethlehem Governate of Palestine is inscribed as a UNESCO World Cultural Heritage site. Likewise, Neolithic Site of Çatalhöyük (--) a stunning pre-silk road neolithic site dated between 7500 BC to 5700 BC and situated in Konya Province, Anatolia Region of Turkey in Asia Minor is inscribed as UNESCO world cultural heritage site. 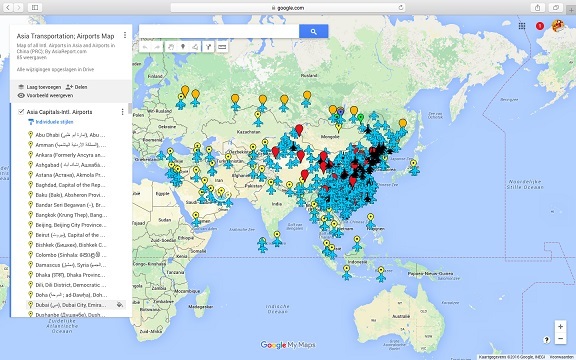 In the year 2012 an airplane flying out of Hotan to Urumqi was nearly hijacked, since leading to increased security and scrutiny of persons of the airport and the train station. 2012: The 374.84 kilometer (232.91 miles) Hami to Lop Nor Railway is completed in eastern Xinjiang-Uighur Autonomous Region. 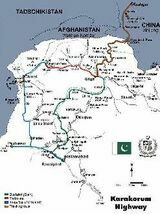 This is a railway line serving the movement of raw materials dug up from the dried up Lop Nor Lake (salts and minerals) from the basin to Hami and then beyond. April 23, 2013: Death of Mullah Omar, spiritual and organizational leader of the religiously fundamentalist and extremist Afghan Taliban and co-destructor of the Bamiyan Buddha's, in Kabul, Capital of Afghanistan. On tactical grounds, the death of the leader is kept secret from the world public by other Taliban leaders, until in July of 2013 Pakistan released the news of the death of Mullah Omar, supposedly in a hospital in Pakistan. On July 30 the Afghan Taliban released an official statement which admitted the death of the leader, mentioning only illness as the reason of his demise. In April 2015, two years after, celebrating the 19th year of his leadership, the Taliban release a biography of Mullah Omar, which among many things states that the Mullah remains in touch. The supposed continued leadership of Mullah Omar from the next realm is again expressed in July 2015 when it is claimed that Mullah Omar backed peace talks with the official Afghan Government (headed by Hamid Karzai). June 2013: The Golestan Palace (Persian: کاخ گلستان , Kākh-e Golestān), former Qajar Dynasty (1742–1797) Royal Housing Compound and one of the oldest building of the historic Capital of Iran at Tehran, is given a UNESCO World Cultural Heritage Status. November, 3, 2013: Completion of the 1771 kilometers long Lanzhou to Urumqi High-Speed Railway (also: Lanzhou Second Railway since the first slow train version still exists following its old trajectory entirely in Gansu Province to Jiayuguan), with 31 train stations. Passing from the Yellow River (Huang He) at Lanzhou , to Xining in eastern Tibet ( Qinghai ) and on to Jiayuguan , the end of the Great Wall of China in the hexi corridor up in Gansu Province and via Hami and Turpan to Urumqi , the new railway drastically reduces travel time along parts of the Chinese Silk Road. The first test train to run the complete track rode on June 3 of 2014. The full line was opened on 26 December of 2014, heralding a new era of economic development of the west. Travel time along the new line was 20 hours and 12 minutes, which is to be shortened by means of a new generation of even faster high-speed trains which are to cruise at around 400 kilometers per hour. In February of 2014 a major earthquake rattled (Keriya ; Mugala) Yutian and County of Hotan Prefecture . With a strength measured at 6.9 on the Richter scale the quake was felt throughout the Tibetan Plateau, in Kashmir and north India and as far away as Almaty in Kazakhstan . No deaths or major material damage was reported. March 7, 2014: ISIl terrorists start demolishing the ancient ruins of Hatra (Al-Hadr ; Arabic: الحضر ; Persian: هترا ), the priceless cultural relics found in the Al-Jazira Region of Iraq . The ancient ruined site is leveled to the ground. June 10, 2014: Ancient Nineveh, Mosul in northern Iraq is taken by troops of ISIS. 2014: Beit Guvrin-Maresha National Park in Israel, 13 kilometers from Kiryat Gat, encompassing the ruins of Mareshra, one of the important towns of Judah during the time of the First Temple (12 tribes of Judah), and Beit Guvrin, an important town in the Roman era (in Palestine), when it was known as Eleutheropolis together popularly recognized as " Caves of Maresha and Bet-Guvrin in the Judean Lowlands " are granted UNESCO World Cultural Heritage Status as representing a microcosm of the ancient caves of (historic) Judea (or Judah). In addition, "Palestine Land of Olive and Vines" also known as the "Battir (--) Cultural Landscape of southern Jerusalem" known for its ancient irrigation systems and canals and in its long history among things the location a last stand of a Jewish Rebellion against the romans in 135 B.C., situated at the small village of Battir in Betlehem Governate of Palestine (right on the border with Israel) are also listed as World Cultural Heritage. May 2015: After initial successes in founding an alternative state in Syria and parts of northern Iraq, the terrorist organization Islamic State of Iraq and the Levant (ISIL) announced its intention to destroy the site ancient Silk Road site of the Palace of Nimrud (Today: Mosul, Niniweh Governate, Al-Jazira, Iraq) because of its "un-Islamic" Assyrian nature. In March 2015, the Iraqi government reported that ISIL had used bulldozers to destroy excavated remains of the city. Several videos released by ISIL showed the work in progress. In November 2016 Iraqi forces retook the site, and later visitors confirmed the extensive destruction of thisite, among things renowned due to its mention in The (Holy) Bible of Christianity and at the end of the 9th century briefly the Capital of the Assyrians. July 4, 2014: Terrorist leader Abu Bakr Al-Baghdadi, proclaims himself " Caliph " and thus ruler of all Muslims from the pulprit of the famous historic Grand Al-Nuri Mosque of Mosul (Historically: Niniveh of the Assyrians) in northern Iraq, the historic Mosque among things described by famous Silk Road traveler, the Moroccan Ibn-Battuta (Life: 1304 AD - 1368 or 69 AD)). It was the first time that the leader behind the sinister " Islamic armies " of ISIS (Or ISIL) revealed himself. The declaration of the founding of the Islamic State of Iraq and the Levant was followed by a three year spree of seemingly mindless terror, violence, bloodshed and destruction of lives, cities and cultural relics throughout Syria, Iraq and Iran, and other casualties in nations of the world. Some 3 years later Al Baghdadi is suspected dead by an airstrike while about a week later in June 2017, the Grand Al-Nuri Mosque is laid waste by nearly defeated ISIS Forces. Early 2009: Mimicking city planning measures taken after the 1989 Tiananmen Square student uprising the Chinese Central Government announces a "Dangerous House Reform Program" for the Old City of Kashgar. According to the $500 million plan, the city is to be revised and modernized while the ancient buildings of the Old City of Kashgar will largely be demolished, thus -under pretext of safety and development- breaking up the core of the Uyghur Community in the city. When the news of the Draconian plan is received silk road experts and local Uyghurs are shocked. In 2009: Control over the area of the ruins of the city of Ur in northern Iraq were handed back by the US Military to Iraqi authorities, who announced the restorations of the site and plans to bring in tourist when possible. In 2009 ethnic riots of Uyghurs targeting Han peoples erupted in Hotan and neighboring Kashgar City, soon transmitting up to the regional Capital of Urumqi where chaos also erupted. For days there were pitched battles between local Uyghur people and the local Han Community and Police. Extensive violence and multiple deaths occurred before a hard crackdown by authorities restored calm in the city. In March of 2010: Less than a year after large scale ethnic rioting shook the city, the world learns of the first planned destruction of the historic old city quarter of ‍the famed Silk Road market town of Kashgar, the Uyghur Ethnic Capital. Throughout the year, homes and buildings which for a 1000 years had determined the character of the old city were reduced to heaps of rubble, clearing block after block. Some spoke of a repressive bureaucratic reflex and a philistine approach to solving social differences. July 30, 2014: Just a day after being visited by Dutch TV Crew (Floortje Dessing), Jume Tahier, Imam of the historic Id-Kah Mosque (Uyghur: ھېيتگاھ مەسچىتى, Хейтгах Месчити‎ Hëytgah Meschiti, Chinese: 艾提尕尔清真寺; pinyin: Àitígǎěr Qīngzhēnsì) (from Persian: عیدگاه Eidgāh, meaning Place of Festivities) , the main Uyghur Mosque in Kashgar, the Uyghur Capital along the Silk Road in the west of Xinjiang-Uyghur Autonomous Region is stabbed to death just before the attendance of morning prayers. In the aftermath it is revealed (by authorities) that he was murdered by three young Uyghurs over his pro-Chinese Government stance. The three are subsequently sentenced to death in a show press and executed not long after as clear warning to the local Uyghur population who's homelands are to be found in Aksu City Prefecture , Hotan City Prefecture and Kashgar City Prefecture of Xinjiang. In July of 2015 Pishan County of the historic silk road Hotan City Prefecture in the Xinjiang-Uyghur Autonomous Region in the Far West of the Peoples Republic of China was struck by a heavy earthquake measuring 6.4 on the Richter scale and striking some 10 kilometers below the surface. In the event some 3000 houses were toppled, six people lost their lives and 38 were injured. In the immediate aftermath of the quake the Chinese Ministry of Defense announced that for the first time it had used a drone aircraft to survey the large stricken area, in a timely manner identifying the key area's in need of help. The unmanned air vehicle probably operated from Hotan Airport and Airbase (PLAAF) in the Hotan Prefecture where since the existence of a base for UAV's was publicly admitted. 23 August (or possibly earlier, in July of), 2015: ISIS troops which have taken the historic city of Palmyra in Syria, detonate explosives inside the world cultural heritage site and ancient ruins of Temple of Baalshamin (معبد بعل شمين) at Palmyra in Syria. UNESCO, the United Nations patron organization for international cultural and natural heritage condemned the act in strongest terms describing at as a wilful " war crime " . August 30, 2015: the world famous silk road world cultural heritage site of the Temple of Baal (also Bell ; معبد بل) at the ancient ruins of the city of Palmyra in Syria are destroyed by " Islamic " radicals associated with ISIS (ISIL). 8 September 2008: At Bamiyan, Afghanistan, archaeologists searching for a legendary 300-meter statue at the site of the already dynamited Buddha's announced the discovery of parts of an unknown 19-meter (62-foot) reclining Buddha, a pose representing Buddha's Paranirvana. 9 September, 2008: Some 7 long years after the Taliban destroyed the 1500 year old Bamiyan Buddha's, edifices of silk road culture and among the greatest historical treasures of Afghanistan, the find of a previously unidentified third Buddha statue at Bamiyan is announced to the world. According to the Afghan-archeological team led by Professor Zemaryali Tarzi, earlier in the year during the summer they had finally identified a 19 meter long reclining Buddha, the existence of which had been suspected since the times of the single restoration project of the Bamiyan Buddha's during the 1970s. It was found within the foundations of an ancient Buddhist temple situated at some 2 kilometers distance due east of the main location of the Buddha's of Bamiyan. Although the find in case deals with a reclining (sleeping) Buddha, according to Professor Tarzi, the search for the 300 meter long reclining Buddha statue described by the Chinese Monk Xuanzang who traveled through Afghanistan on the way to India in 630 AD, is still on. centuries later, will have to be revised. Since, even older oil based paintings have been identified at Bamiyan and at the location of Mes Aynak, another ancient Buddhist site in Afghanistan situated due south of Kabul. In 2002: Hotan , the historic silk road desert Oasis Town along the southern rim of the Taklamakan Desert, was struck by a major earthquake. In the current days of the 21st century Hotan rarely makes the news except for the repeated occurrence of violent attacks on representatives of Chinese Government Authority. Among things bombing / stabbings and attacks on Police Stations have occurred in Hotan in recent years. June 30, 2018: In June 24 to July 4th at the 42nd meeting of the Committee at meeting in Manama (Bahrein) Sasanid Archaeological Landscape of Fars Region, in Iran, encompassing the ancient Sasanid cities of Bishabpur, Firouzabad and Sarvestan is inscribed as ‍UNESCO World Cultural Heritage Site bringing the number of heritage sites in the country to 23.
between the 10Th Century and 8th century B.C. Through archeological research ongoing throughout the 1990's and the first decade of the new millennium it has been established that at a later time (during the 8th century B.C.) the stone pillars were used to form rectangular rooms of structures that have been dubbed the earliest known (religious) temples known by mankind.